As the 150th Anniversary of the Civil War continues from March 21-23 in Jackson County, Alabama, one of the largest reenactments of the war takes place. The Siege of Bridgeport attracts thousands of people for this annual event with period music, encampments, and vendors. I myself have never attended a reenactment that I didn’t love and learn from. 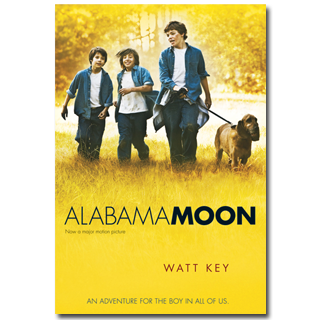 But since I can’t be in Alabama this weekend, I am picking up one of the great books about the state, Alabama Moon by Watt Key, published in 2006. This book escaped my notice when it appeared in hard cover; only the enthusiastic responses of readers ages eleven through fourteen brought it to my attention. I now consider Alabama Moon one of the best survival stories in existence for children, worthy to sit on the shelf right next to Gary Paulsen’s Hatchet and a perfect book to recommend to those who want more books like it. “Just before Pap died, he told me I would be fine as long as I never depended on anyone but myself.” So begins the saga of ten-year-old Moon, who needs to bury his own father. Moon has been raised in the remote Alabama forest, taught by his father to survive on the plants and animals found there. He has also been trained to fear and hate the government and government officials. In 1980 the authorities are not enthusiastic about a ten-year-old living on his own, and they incarcerate him and then place him in a reform school. But for a boy who has learned to fish, hunt, trap, and understand the elements and weather, Moon has an incredible array of skills at his command. Escaping the school with some friends proves quite easy for this resourceful boy. So he continues to hide and run. The book provides many delicious details of escaping detection, building shelter, finding edible plants, and utilizing the resources of the natural world. If you imagine Sam Gribley of My Side of the Mountain or Brian of Hatchet on the lam, you essentially have the plot and feeling of the book. Eccentric characters and a strong sense of place add to its authentic feel. In a very satisfying way, young Moon changes in the course of the narrative. He begins to understand that his father may not have had all the right opinions and answers. Like most readers, I found him so appealing as a character that I read breathlessly until the close of the book. Packaged in paperback with an attractive cover drawn from the movie, Alabama Moon belongs on the shelf of anyone who loves adventure and survival fiction. The bloodhound burst from the cane thicket and leaped into my chest before I had time to study his tail. I landed on my back with him on top of me. My arms were tangled somewhere beneath me and my legs were pinned by the dog’s weight. Kit and Hal yelled at me from up in the tree. All I thought about was what it would feel like when the bloodhound took his first bite of me. I squeezed my eyes shut and waited, but the bite never came. The bloodhound licked me until I brought my hands up to shield my face. Originally posted March 23, 2012. Updated for . Thank you for reviewing this book. I loved Hatchet as a child and now have something else to recommend to my boys when they get older. Both Hatchet and My Side of the Mountain were favorites of my boys. I think these books of survival and using your own intuition amd wits are essential for the children of today to read and hear. I will definitely read this one and then recommend it to my fourth and fifth grade teachers. Thank you Anita! This is great! I do not know this one and my students are just finished reading Woods Runner from Gary Paulson. A few are reading Hatch as well. I will pull this from the library and share with my class this week. Thanks. It is now 2015 and my first comment was from 2012 when the book was first mentioned. I have since read the story. It is just as wonderful as Anita said it would be. Definitely up there on the list with Hatchet and My Side of the Mountain. Thanks for reminding folks of the book again Anita especially during the 150th celebration of the end of the Civil War. Karen Winnick and Ann Rinaldi have written wonderful historical fiction novels and picture books which also deal with the Civil War era. Both authors are well researched and inspiriing stories.